Very comfortable boots (once broken in) with superb grip. However, the sole could be more rigid and is prone to wear. I bought these boots online, and as soon as they arrived I noticed that they had some creasing on the forefoot. Clearly someone had tried them on and returned them before they were sent to me. However, there were no signs of wear on the outsole and—for what it’s worth—the Gore-tex tags were still attached. I decided that they could not have been worn much. I tested them in water and, once I was satisfied that the waterproofing was intact, I decided to keep them. The leather began to crease heavily as soon as I started walking in these boots, which confirms that the previous owner could have done little more than try them on before returning them for whatever reason. 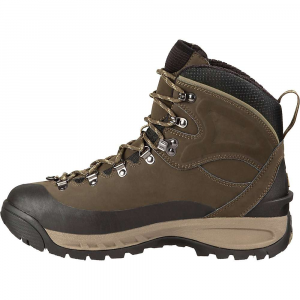 The leather on these boots is a little thinner than on most other hiking boots, and it is naturally crease-prone. This is a minor issue compared to the comfort of these boots. I have had problems of fit with other boots, mainly because of too much depth in the forefoot, meaning that I had to overtighten the boots to get a secure fit. Not with these boots, however. They fit like a dream. 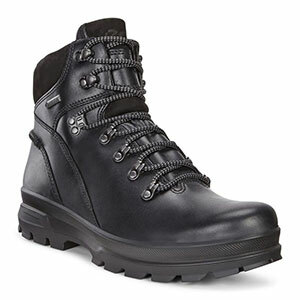 My toes have plenty of wiggle room, but my instep and heel are held securely and the boots feel moulded to my feet. 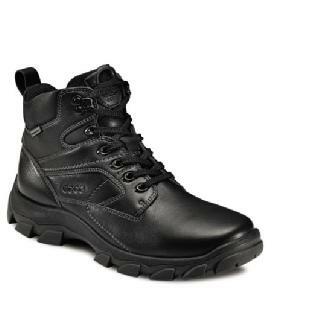 This, together with a thickly-padded ankle collar and a springy insole, make the boots feel very comfortable indeed. 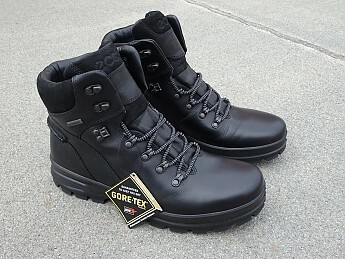 The outsole too is made of softer material than on most hiking boots, meaning that these boots have a more cushioned feel and are less taxing than others when used on paved surfaces. This said, the boots do need breaking in. At first the forefoot leather dug into the joints of my toes as it flexed with each step. After some time it softened up. 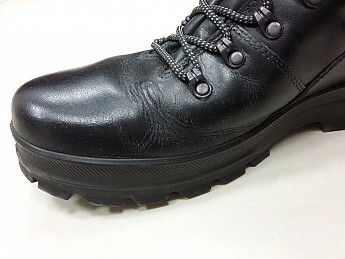 But as the leather settled and changed shape, the lowest lacing eyelet on the right boot started pressing on the bone behind my big toe, causing soreness (but no blister) in that spot. I persevered in the hope that the breaking-in process would resolve this problem too. 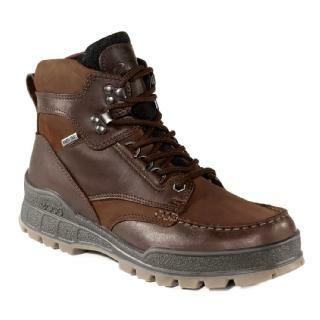 These boots have a proprietary Ecco outsole with deep, widely spaced lugs that offer superb grip. 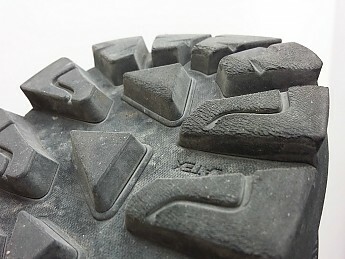 The lugs are flexible, meaning that they have added bite on soft ground. 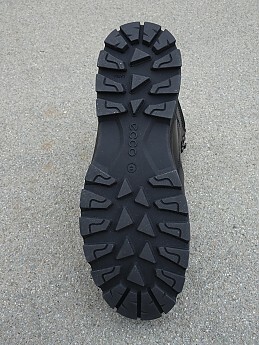 They also have a better than average grip on flat wet surfaces—the most difficult type of ground for any boots. Danish bootmaker Ecco has a good reputation for build quality, and while it’s still early days these boots appear to live up to that reputation. So far the Gore-tex waterproofing is holding up well. For what it’s worth, the boots are made in Portugal. Although the leather looks thinner than the norm, the boots feel sturdy. They are certainly no lightweights: each of my size 45s (US size 11.5) weighs 738g (1lb 10oz), nearly as much as a Lowa Uplander tall combat boot (775g or 1lb 11oz). 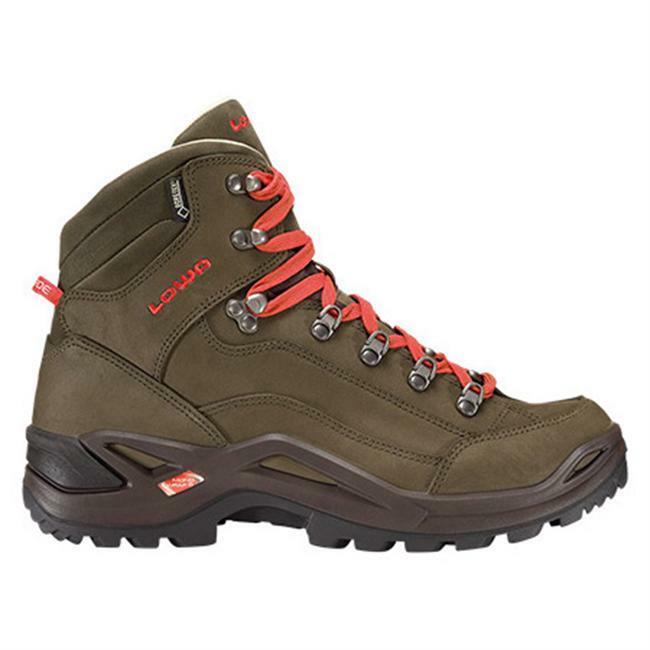 By comparison, a Lowa Renegade hiking boot of the same size weighs 693g (1lb 8oz). The laces are another strong point of these boots. They are excellent. The interwoven grey strands give them a rough texture, thanks to which they tie up securely and do not come undone. The lacing system has a locking eye at the ankle and open hooks on the shaft. 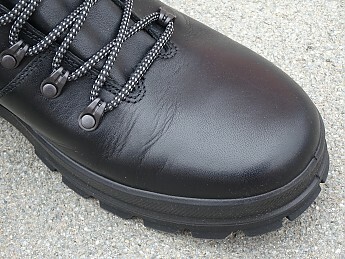 As for the downsides of these boots, the biggest is that the outsoles, being made of a soft rubber, wear easily. I have walked less than a hundred miles in these boots so far, but wear is already evident on the heel lugs. 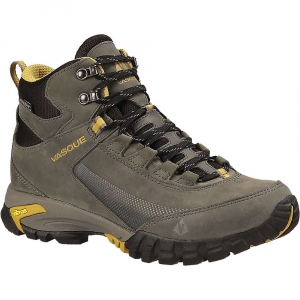 Also, the outsoles are a little less rigid than those of other boots, meaning that they are not ideal for heavy backpacking on rough terrain. This said, so far I have walked in them on rough ground for up to 13km (8 miles) at a stretch with a load of 14.5kg (32lb) on my back, and the soles of my feet felt fine. Finally, the boots lack a protective toe rand. I bought these boots with an eight-day trekking holiday in Scotland in mind, because of doubts about the suitability of my current boots. I have to admit that the Ecco Rugged Tracks are not ideal for this purpose because of their thin leather and limited sole stiffness. They were something of an impulse buy because they were available at a good price. But they’ve won me over with their excellent fit and superb grip. I haven’t quite finished breaking them in, but if all goes well I will probably use them on the Scottish trip. My Scottish trip was scheduled for May 2017. I started wearing these boots on training walks, but during one 13-mile walk at the end of April I got bad heat rash on my forefeet and around my ankles. This was the fault of the weather, not the boots: it had been a hot and sunny day. Still, I wondered whether the close fit of these boots had something to do with it. After all, feet supposedly swell during a long walk. On my final training walk a week later the weather was even hotter, so I wore sandals with light socks to avoid a recurrence of heat rash. And I decided to use my other boots on the Scottish trip itself. They have a looser fit than the Eccos and I thought that perhaps there was something to be said for this. The weather in Scotland was not likely to give me any heat rash, but all the same I did not want to risk any problems arising due to my feet swelling up on the trek. Ongoing soreness from contact with the lacing eyelet on the right boot was another factor deterring me from using these boots. Still, I like my Eccos and I won't give up on them. I will use them as urban winter wear if nothing else. Their excellent traction on flat surfaces will be useful in that role. Nice review. I do wonder about the long term life of these if you are already seeing this kind of wear after only 100 miles. Thanks G00SE. Yes that's a valid point. Thanks for the initial review, Charles. Please let us know how these work out on your upcoming Scottish trek. 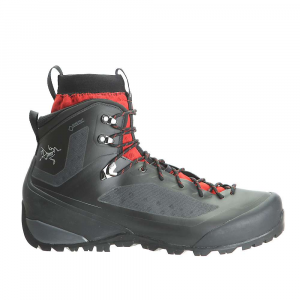 The Ecco Rugged Track GTX High is not available from the stores we monitor.